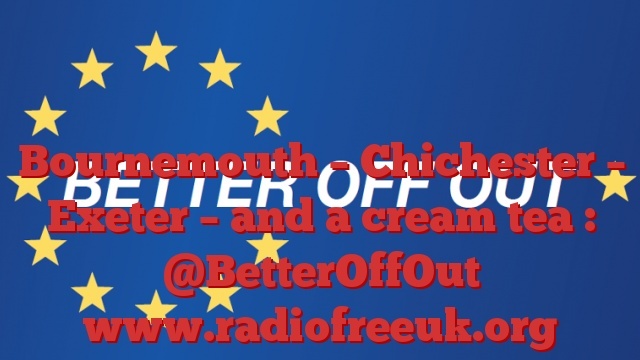 This week our podcast follows Better Off Out on tour around southern England. We start in Bournemouth where we had a pop-up stall in the main town square. We then go on to a rather cold and windy Chichester where we had a proper stall in the main town market. Finally we head west to Exeter where we launched the regional campaign and had some meetings, though I also found time to ponder on what the airport can tell us about Britain’s relationship to the European Union, the USA and what the future holds for us. Oh, and there was time for a cracking Devon Cream Tea as well. We went to Bournemouth on a nice warm day when there were plenty of people out and about. We got a very good reception. Chichester was not quite so welcoming, greeting us with a cold wind that later in the day developed into rain. Never mind, we had a prime pitch in the market and all went well. Our visit to Exeter was primarily to launch the campaign in the Southwest of England and to take part in meetings, but I took the opportunity to have a think about Brexit. And you can’t go to Devon without having a cream tea. At least, I can’t.